Eric and Norma Jean Annett founded Annett Bus Lines in 1976 with one motorcoach that traveled 65,000 miles its first year. Today, Annett Bus Lines is one of the most respected motorcoach companies in North America. It was 40 years ago when Annett Bus Lines started to traverse the highways and interstates throughout the state of Florida and Southeast United States. We began as one of the first private bus companies just before deregulation in the late 1970’s. In the early 1980’s, Annett operated scheduled line haul service under the Trailways flag. While our company has grown tremendously since those early days, our ownership remains in the Annett family! 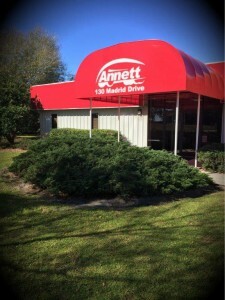 Annett now has four garages strategically positioned throughout the state of Florida. Our corporate headquarters is located in Sebring. Our other garages are positioned in Ocala, Jacksonville with our newest addition in Madison. We have buses positioned in Tallahassee and along the east coast. Location, location, location! We’re positioned to provide excellent customer service! Annett Bus Lines still thrives under family management. In 2002 the company successfully transitioned to the 2nd generation of family ownership. It’s now owned and operated by brothers Brian and David Annett. With a continued focus on Quality, Safety and Reliability, Annett Bus Lines is setting the Standard of Excellence in the Bus Industry.